Grouping of seventeen (17) American currency items, including Bank of Nashville checks. 1st item: One (1) page of uncut remainder "James Monroe Post Notes" printed for the Bank of J.H. Piatt and Company of Cincinnati, Ohio. Includes one (1) $1 note, one (1) $2 note, one (1) $3 note, and one (1) $5 note. 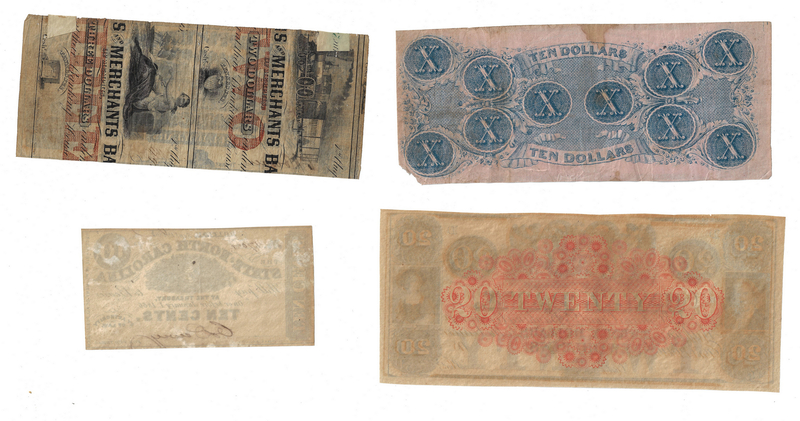 2nd-4th items: Two (2) page of uncut remainder bank notes for the Canal Bank of New Orleans. Includes four (4) $5 bank notes and four (4) $20 bank notes. Also includes one (1) cut $20 remainder bank note. 5th item: One (1) page of uncut remainder notes from the Canal and Banking Company of New Orleans, Louisiana. Includes four (4) $5 bank notes. 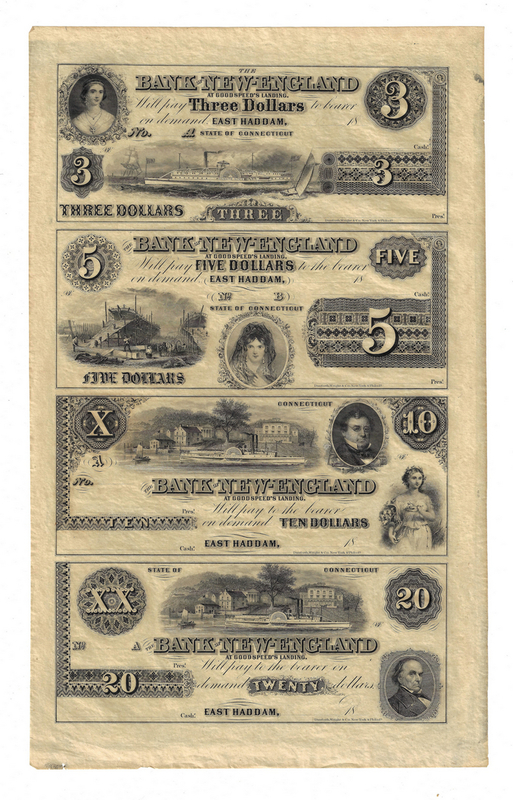 6th item: One (1) page of uncut remainder notes from the Bank of New England at Goodspeed's Landing of East Haddam, Connecticut. Includes one (1) $3 bank note, one (1) $5 bank note, one (1) $10 bank note, and one (1) $20 bank note. Note: Remainder Notes were those that were left in the bank upon it's closing. They "remained" in the bank vaults and never circulated. Most only become available to collectors when the vaults or banks were cleaned out and the remainders were then discovered. 7th item: $3 Mississippi and Tennessee Rail Road Company note dated 1862 from Grenada, Mississippi. Serial # 8084/ pp A. President/Treasurer signatures. Stamps reading "Two" and "three" surface and verso of bill. Printed on the back of Farmers' & Merchants' Bank of Memphis notes from Tennessee. 8th item: $1 bank note dated 1855 from the Farmer's Bank of Wickford, Rhode Island. Serial # obscured by black stamp reading "Broken Bank Suffolk Bank" surface and verso of bill. President/Cashier signatures. 9th-11th items: Three (3) checks from the Bank of Tennessee of Nashville, Tennessee, including one (1) check for $264 dated April 16, 1857, Serial # 21; one (1) check for $10 dated December 11, 1858, Serial # 50; one (1) check for $225 dated November 9, 1859, Serial # 77. All signed by Samuel Henderson. 12th item: Fifty Cents note dated 1862 from the Greensboro Mutual Life Insurance and Trust Company of Greensboro, North Carolina. Serial # 3071/ pp H. Treasurer signature. 13th item: 10 cents note dated 1862 from the State of North Carolina. Serial # 1704/ pp P. Treasurer signed. 14th item: $3 bank note dated 1862 from the Bullion Bank of Washington, District of Columbia. Serial # 3679/ pp A. President/Cashier signatures. 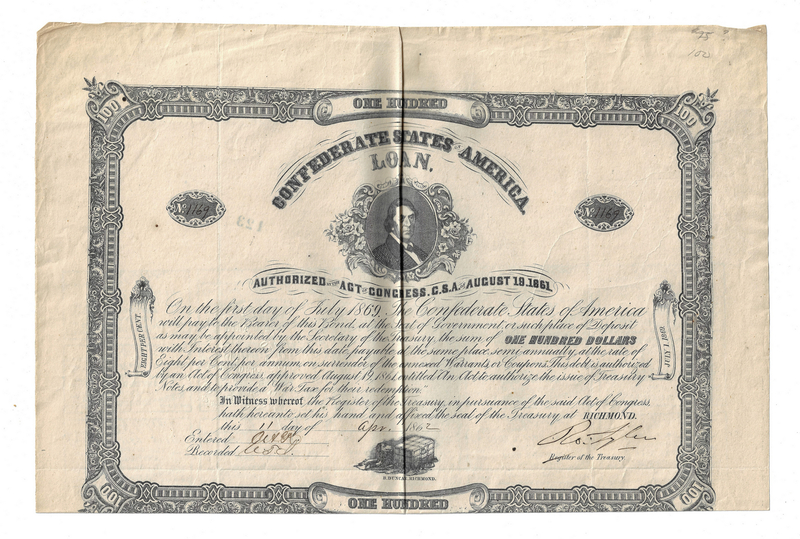 15th item: August 19, 1861 Confederate States of America (CSA) bond $100 at 8 percent interest. Serial # 1169. Robert Tyler, CSA Register of the Treasury, signature. All coupons intact with serial numbers and "For Register of the Treasury" signatures. 16th item: December 2, 1862 Confederate States of America (CSA) $10 bill from Richmond, Virginia. Third Series. Serial # 35212/ pp E. "For Register" and "for Treasurer" signatures. 17th item: One (1) page of uncut $5 State of Louisiana "Baby Bonds", issued for certificate No. 752, Series 187. Includes one (1) bond with Serial # 128542/ pp C; one (1) bond with Serial # 128543/ pp C; one (1) bond with 128544/ pp C; one (1) bond with 128545/ pp C. Treasurer signature with Governor facsimile signature. All coupons intact with serial numbers and Treasurer signatures. Items range in size from 2" H x 2 3/4" W to 16 5/8" H x 14" W. Provenance: the estate of Celia (Cece) Webb, Nashville, Tennessee. CONDITION: Overall good condition with tears, dampstaining, fading, etc. to be expected from age and manner of use. All items in circulated condition unless specified in description.